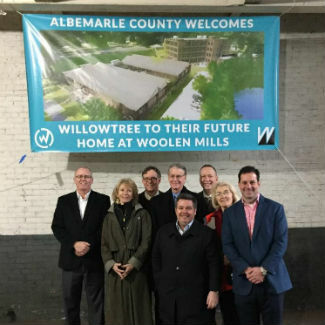 Albemarle County joined with partners WillowTree, Inc. and Woolen Mills to mark the start of construction for the redevelopment of the Woolen Mills site, which will transform into a best-in-class corporate campus for WillowTree. The project will keep WillowTree, a valued local employer, in the region with an anticipated private investment of $25 million and a minimum of 200 new jobs, at above-average wages for Albemarle County. Founded in 2007, WillowTree, Inc. is a computer software company committed to helping clients realize the potential of rapidly evolving mobile technologies, from developing a mobile strategy to launching mobile products. WillowTree’s clients range from medium and large businesses to Fortune 500s, and include Regal Cinemas, Wyndham Hotels, GE, AOL, PepsiCo, and the University of Virginia. As part of the Woolen Mills redevelopment project, the County will partner to provide public-serving infrastructure, including a critical pedestrian bridge and trail connection to link the site to the existing Rivanna Trail across Moore’s Creek. The project will also include public parking to access the recreational assets and establish a shuttle connecting the site to downtown Charlottesville as part of the County’s commitment to alternative transit solutions. Recognizing the economic development potential not only of Woolen Mills but also the entire Broadway Street corridor, the County will fund an economic revitalization action plan focused on maximizing business development and place-making opportunities in the 45-acre industrially-zoned area of the County.